Looking for a beach rental on Topsail Island? RentABeach makes shopping for a Topsail Island beach vacation rental easy by combining offerings from multiple property management companies. Topsail Island rentals include beach houses and condos on North Topsail Beach, Surf City, and Topsail Beach. 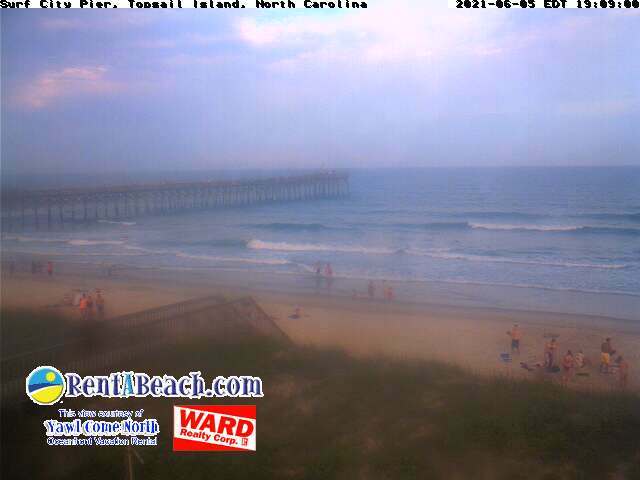 Topsail Island is a 26-mile long barrier island located between Jacksonville, NC and Wilmington, NC. The northern half of the island is incorporated by the town of North Topsail Beach and includes 5 oceanfront condo complexes and hundreds of beach homes. Many of the newer, larger, and more luxurious homes are located on North Topsail Beach, including the home used for the interior scenes of the movie "Nights in Rodanthe". View larger image and LIVE STREAM! The most established part of the island, and the center for shopping, dining, and surfing is the town of Surf City. Still a relatively quiet and charming beach town, Surf City is a great place to stay if you'd like to be able to park your car for the week and just walk or ride a bike to restaurants and stores. Near the center of Surf City, the Surf City Ocean Pier (see our webcam, right) is a favorite gathering point for surfers, fishermen, and beach lovers in general. On southern end of the island is the quaint town of Topsail Beach, where families enjoy the quiet traditional beach cottages and the very small town setting. With deep water access on the sound side and in the canals at the southern end, Topsail Beach is a favorite for boaters too. Shop and compare until you find the vacation rental which is right for you!